We at Sacred Heart Catholic Church invite you to learn more about the Catholic Church by enrolling in our R.C.I.A. (Rite of Christian Initiation for Adults) classes. There you will learn weekly about the richness, the practices and the history of the Roman Catholic faith. You may have questions about the Catholic Christian faith that we can help answer. We have put together a short 10 Answers to Questions You May Have About The Catholic Church. 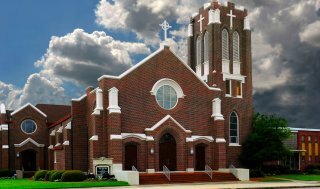 We at Sacred Heart Catholic Church understand that you might have questions about the Catholic Church. Below, we hope to provide you with some compelling answers to a few of the more common questions that people around the world have had about Catholics and their faith. If you are open to seeing what God is offering, you might be surprised to find it within the Catholic faith. As you read this guide, please keep in mind that the Catholic Church has been around for 2,000 years. There are many facets of the Catholic Church, steeped in theology and tradition, that are impossible to cover in this short forum. The Church has many teachings and practices that have evolved over the centuries. Answers to your questions are available, but you must invest the time to find the answers. The Lord wants us all to know and understand His truth so that we can embrace it wholeheartedly and live by it. Thank you for taking the time to learn more about the Catholic Church. 1. Why do Catholics practice infant baptism? Shouldn’t the sacrament be performed when the child is old enough to make an informed decision? 2. What is a sacrament? 3. Why do Catholics confess their sins to a priest instead of directly to God? 4. Why does the Catholic Church believe that Christ is present in Eucharist? 5. Why cannot non-Catholics receive Holy Communion in the Catholic Church? 6. Why do Catholics believe that the Catholic Church is the one true Church founded by Jesus Christ nearly 2,000 years ago? 7. Where does the Pope get his authority to lead the Catholic Church? What does “apostolic succession” mean to a Catholic? 8. What does it mean to say the Pope is infallible? 9. Do Catholics worship Mary? Why do they give emphasize Mary so much? 10. Why cannot women be priests? To explain things simply, it comes down to cause and effect. The Church’s ‘cause’ is based on the teachings concerning original sin. Original sin originated from the result of Adam and Eve bringing sin into the world in the garden of Eden. The ‘effect’ is that original sin is believed to be the stain on every person’s soul born into this world signifying the human race’s fallen nature. Baptism, in the Catholic Church, is the washing away of the stain of original sin and turning the child of man into a child of God. A point of Baptism that is often misconstrued is that baptism is NOT a symbolic act, but an actual act of salvation. Ezek 36:25-27, it says, "I will sprinkle clean water upon you, and you shall be clean from all your uncleannesses...a new heart I will give you and a new spirit I will put within you...and I will put My spirit within you..." Yes, anyone at any age can be baptized, but God does not withhold his love and grace from anyone, so why should we, as parents, deny our children the opportunity of becoming a child of God as soon as possible? Is it not better to start growing in faith sooner rather than later? A quick answer to this question is: that’s the way God wants us to do it. The Bible says in James 5:16 “confess your sins to one another and pray for one another, that you may be healed.” Notice that it does not say for your to confess your sins straight to God, but to one another. In Matthew 9:6, Jesus tells us that He was given authority to forgive sins. Then in verse 8, sacred Scripture tells us that such authority was given to human beings. Not just one man, but human beings were also given the authority to forgive sins. In John 20:21-23, the first thing that Jesus says to the disciples on the evening of His Resurrection is: “Peace be with you. As the Father has sent me, so I send you.” As you just read in Matthew 9:6, Jesus was sent with the authority to forgive sins. So how does He send his disciples? With the same authority to forgive sins. He goes on to say in verse 22: “Receive the Holy Spirit. Whose sins you forgive are forgiven them, and whose sins you retain are retained.” Thus, the Bible tells us to confess our sins to one another. It also tells us that God gave men the authority to forgive sins. So, when Catholics confess their sins to a priest, we are simply following a plan laid down by Jesus Christ. God forgives sins through the priest. It is His power, but He exercises that power through this ministry. The Catholic doctrine of the Real Presence is that Jesus Christ is literally, not symbolically, present in the Eucharist: body, blood, soul and divinity. Catholics believe in the Real Presence in the Eucharist because Jesus Christ tells us this is true in Sacred Scripture: “I am the bread of life. Your ancestors ate the manna in the desert but died; this is the bread that comes down from heaven so that one may eat it and not die. I am the living bread that came down from heaven; whoever eats this bread will live forever; and the bread that I will give is the flesh for the life of the world (...) Amen, amen, I say to you, unless you eat the flesh of the Son of Man and drink his blood, you do not have life within you. Whoever eats my flesh and drinks my blood has eternal life, and I will raise him on the last day. For my flesh is true food, and my blood true drink. Whoever eats my flesh and drinks my blood remains in me and I in him.” (John 6:48-56) Plus, the early Church Fathers directly state or imply that the bread and the wine offered in the Lord’s Supper is really the body and blood of Jesus Christ. This doctrine of the Real Presence has been around for nearly 2,000 years and is one of the fundamental doctrines of the Catholic Church. The miracle of God’s physical presence to us at every Mass is the truest testament of Christ’s love for us and His desire for each one of us to have a personal relationship with Him. This is a question that both non-Catholics and Catholics often ask. It is especially asked when at a Catholic wedding where non-Catholics are gently told they are not able to participate in Holy Communion. As discussed above in the previous question, Catholics believe in the Real Presence of Jesus Christ in the Eucharist. This means that what appears to be bread and wine in the Eucharist is really Jesus’ body and blood, not just symbols of His body and blood. When Catholics receive Holy Communion, it represents the unity among all those in communion with the Catholic Church throughout the entire world who believe in the Real Presence of Jesus in the Eucharist. Therefore, only those who believe in the Real Presence may participate in this sacrament of oneness with Jesus Christ and His Church. The Catechism of the Catholic Church states that “the celebration of the Eucharistic sacrifice is wholly directed toward the intimate union of the faithful with Christ through communion.” (CCC 1382) Ultimately, Catholics believe that we cannot celebrate this unifying sacrament with other Christians while there are disagreements about the Eucharist itself. However, Catholics pray for the day when we can reconcile with other Christians and share in the unity of God’s people through Holy Communion. Just as Christ established a visible Church, He also appointed Peter as the first pope, giving us a visible person to guide the Church. Since the pope is guiding and teaching the Church in Christ’s name, His teachings must be infallible. Christ’s profound love for the Church is shown to us through the doctrine of papal infallibility, which conveys that the pope is preserved by God from error when teaching on matters of faith and morals. How does this show Christ’s love for us? He did not want to leave His Church in darkness. He wanted His doctrines to be consistent so His people could be guided by truth. The core of papal infallibility is faithfulness to Christ. All of the Catholic Church’s teachings are Christocentric—they point toward Christ, who is at the center of her teachings. Having Christocentric teachings is why the Catholic Church does not change her doctrines to adjust to the changes in society and culture. The pope helps to uphold and preserve the teachings of Christ. Jesus Himself promised us, “I am with you always, to the end of time” (see Matthew 28:20). To make true His promise, Christ gifted the Church with an unbroken line of popes for 2,000 years, teaching with the papal infallibility that Christ bestowed on their office. Catholics believe that worship is reserved for God alone. Catholics do not worship Mary, but they do venerate her. By veneration, we mean that we honor our Blessed Mother with great reverence and devotion because she is the Mother of God. Mary is the model of perfect love and obedience to Christ. God preserved Mary from sin and, by the power of the Holy Spirit, conceived our Lord Jesus Christ. We Catholics cannot help but honor Mary for her “yes” made the Incarnation possible. And without the Incarnation, there would be no salvation. Mary is the most beautiful model of the total submission to the will of God. Catholics do not regard Mary as equal to Christ but venerate her because of her relationship to Christ. As Catholics, we pray that we can respond in holiness to God’s call in our lives just as Mary did. Church teaching on the ordination of men to the priesthood can find its roots directly in the teachings of Christ. While He was on Earth, Christ chose men to be His apostles and He passed His teachings and authority directly onto these men to carry on the work of preaching the good news and forgiving sins. The Catechism of the Catholic Church, in article 1577, explains, “The Church recognizes herself to be bound by this choice made by the Lord himself. For this reason, the ordination of women is not possible”. The Catechism goes on to tell us in article 1578 that “No one has a right to receive the sacrament of Holy Orders. Indeed no one claims this office for himself; he is called to it by God”. Jesus came to this earth in the form of a man. It makes sense then that He chose his representatives here to be men. Even though we do not know why Jesus made the choices He did, we do know that He does not consider women to be inferior to men. Christ simply made clear that this particular vocation of the priesthood would be reserved for men. In obedience to Christ and the will of God, the Catholic Church will continue to follow the practice of only ordaining men to the priesthood. We hope that this document has answered many of the questions that you might have about the Catholic Church. Most of the information contained within this document was gathered at catholicscomehome.org. We are certain that you will have many more questions regarding Catholicism and your faith. Please contact this parish’s priest or deacons to have your questions answered. Also, many good resources can be found online.